A new fitness concept is taking Chesterfield by storm. 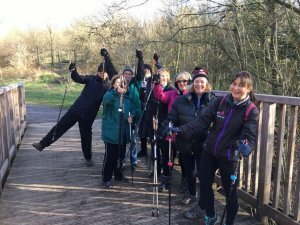 Visitors to Holmebrook Valley and Poolsbrook Country parks may have noticed people walking with what look like ski poles – but they are in fact Nordic walking. 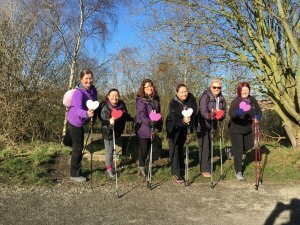 Originally used by cross country skiers as a way to stay fit during the summer, Nordic walking is growing hugely in popularity, including in Chesterfield where a variety of classes and groups are taking place. Laura Daniels is a local Nordic Walking UK Instructor, running Chesterfield Nordic Walking which leads groups and sessions at Holmebrook Valley and Poolsbrook as well as at Queen's Park, Hardwick and along parts of Chesterfield Canal. "It's suitable for all ages and fitness levels, simple to learn and really sociable," said Laura. "By using the specially designed poles, you can use all the major muscles in the body and burn up to twice as many calories as ordinary walking but the best thing is that the poles actually propel you along so it feels easier!" The poles also reduce pressure on the knees and joints and the gentle upper body movement is great for easing back and neck pain too. It's so effective that it is being used for weight loss, rehabilitation and sports specific training all the over the UK. As a qualified instructor Laura runs taster sessions and Learn to Nordic walk technique courses to ensure that participants learn the correct technique in order to get the whole body working and get the full benefit and fastest possible results. 61-year-old Barbara, from Chesterfield, is among those who have seen the benefits of Nordic walking. She first learnt to Nordic walk three years ago and has been a regular participant for the last three months. 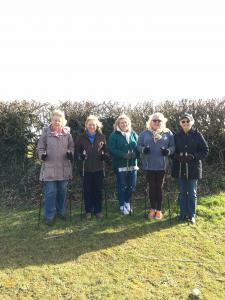 She said: "I started, as a keen walker anyway, because I thought using poles on a walk would help my knees but soon realised Nordic walking gives many more benefits and is really a workout for the whole body. "I enjoy it because it gives the benefits of a gym workout but outdoors. It's also good exercise that doesn't leave you too breathless to enjoy the social side of Nordic walking. "Since walking regularly I feel fitter and more toned. My other forms of exercise are hill walking, cycling, Pilates and yoga, which all have different health benefits. I find Nordic walking combines all of these benefits in one as it gives aerobic exercise alongside toning and strength work." Fellow Nordic walker Christine, (47), said: "I love it because you don't need much specialist equipment. "Since doing it I can really feel that my posture has improved and I'm much more conscious about walking tall at other times too. It is great for exercising my upper body too which I don't do in my other exercise, namely swimming. "I love it because its outdoors and doesn't feel a chore but at the same time I can feel that I'm engaging various muscle groups. Its weight bearing but low impact so good for as I get older too." Chesterfield couple Lesley and Philip also enjoy taking part. Lesley said: "We both find it easier on the joints and we are toning our bodies not just the legs. "We enjoy being in a group and find having the class each week makes us committed to attending." 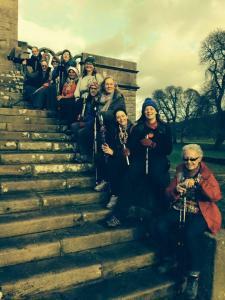 To find out more visit www.chesterfieldnordicwalking.co.uk or call Laura on 07950 222988.